Some might say his artwork looks good enough to eat, but he’d prefer to eat donuts. Join artist Troy Emery for a talk about his practice and why he loves donuts, whilst sampling delicious donuts kindly provided by Donut Shop. Join Dell Stewart for an ice-dyeing fabric workshop. Ice-dyeing fabric is a fascinating method using fibre reactive dyes and ice to create ephemeral multicoloured patterns. We will experiment with cotton and linen fabric and various folding techniques. 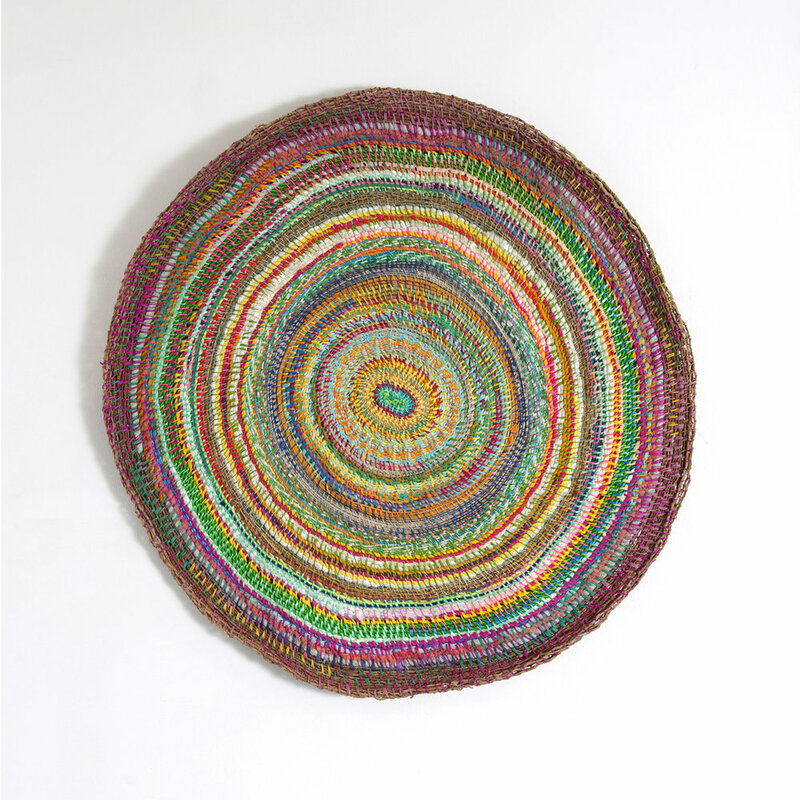 Join artist Elisa Jane Carmichael for a weaving workshop at Blindside Gallery. Elisa will share her weaving techniques using recycled objects to make baskets and other items. Elisa Jane Carmichael belongs to the Quandamooka people of Minjerribah, North Stradbroke Island in QLD. Off Grid brings together works that push beyond the cloth grid – the warp and weft that defines the form of most textiles. Off Grid examines the fracturing of this grid conceptually as well as challenging notions of materiality and the making process. In response to the tradition of textiles in art and craft these artists re-contextualise this grid through various multidisciplinary approaches. Some artists embrace the use of traditional and handmade techniques with alternative contemporary materials, whilst others incorporate new technologies to create immersive environments. Off Grid traverses works that consider textiles within space, using both sculpture and performance to free the cloth grid completely from the two-dimensional. Within Off Grid the act of making and the act of moving are both present. IMAGES | Emma Collard + Cherie Peele, Stick, Swap, Pull, Get-Pulled, Crop and Paste, 2016, Digital Collage. Originally photographed by Elise Grace Wilken, 2014 |Images courtesy of the artist. BLINDSIDE acknowledges the Wurundjeri people of the Kulin Nation as the traditional custodians of the land on which we operate. We recognise that sovereignty was never ceded - we are on stolen land. BLINDSIDE would like to pay respects to Wurundjeri Elders, past, present and emerging, to the Elders from other communities and to any other Aboriginal or Torres Strait Islanders who might encounter or participate in our program. BLINDSIDE is supported by the Victorian Government through Creative Victoria. BLINDSIDE gratefully acknowledges the support of the City of Melbourne through its Arts and Culture Triennial Program.